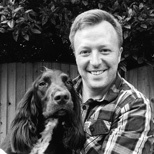 Trainer Ed Kingsland specialises in aiding the communication between each owner and their dog. He can make any dog behave, but that’s not always necessarily helpful for owners who don’t share the same level of dog-speak or understanding! ‘My aim’, he says, ‘is to empower owners so they have the confidence and knowledge to communicate confidently with their own dog. Dogs are meant to be enjoyable – anything I can do to facilitate that enjoyment, great’. Ed shares his life with his wife, small son and an (immaculately behaved!) Sprocker. He’s a member of the Guild of Dog Trainers and preaches positivity, positivity, positivity.